This week 2 units of VFD decanter centrifuge ready for shipment to India for ONGC project in GN factory. The clients ordered 2 units of GNLW453C-VFD with screw pump for their solids control system with their customized painting color. GNLW453C-VFD centrifuge with 18inch bowl and 61inch length, the max G force is up to 2578G, considering the high temperature in India, the positive pressurized VFD control panel with air conditioner for cooling, in some countries with environmental temperature less than 40 degree, the VFD control panel attached cooling tube for cooling. The frequency converter of the main motor, back drive motor and pump motor is all made of ABB brand, the other electric components are also world famous brand like Siemens/ schneider/ ABB, the motor and VFD control panel are all ATEX approval and suitable for 460V/60HZ, 3 phase and apply for zone 1 application. 1) Different with other Chinese centrifuge manufacturer, GN use SKF bearings, since bearing block is the most important part for centrifuge, we use more reliable brand bearing to improve the centrifuge working life and reduce maintenance cost. 2) The screw is completely made of stainless steel, the impeller is protected by tungsten carbide tiles, the fluids distribution port is protected by tungsten alloy and interchangeable. 3) The solids discharge port is also protected by tungsten alloy for wear-resistant, the scraper and side scraper design is to prevent the solids discharge port from abrasion when the solids content is very high. We suggest the client to use shale shaker before feeding to decanter centrifuge when the solids content is very high. 4) Duplex stainless steel 2304 material bowl by centrifugal casting. 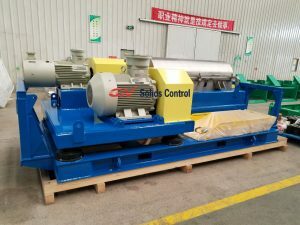 If you need decanter centrifuge for solids control or drilling waste treatment, pls contact with GN solids control sales engineer. How to deal with the boring Mud?